This spectacular pudding is always a favourite with guests. 2 x 250g tins of Crème de Marron (Purée of sweet chestnut). n.b. not suitable for those with a nut allergy. Whisk the egg yolks and sugar in another bowl until creamy. Stir the melted chocolate into the egg & sugar mixture until thoroughly blended. Turn the mixture into a 33x23cm Swiss roll tin, lined with greaseproof paper. Bake at 180ºC/Gas Mark 4 for about 25 mins until firm to the touch. Leave in the tin, place a wire rack then a damp tea towel on top of the roulâde. Let it cool. Dust a piece of greaseproof paper with icing sugar. When the roulâde is completely cool, turn it upside down onto the sugared paper. Peel off the paper it was cooked in. 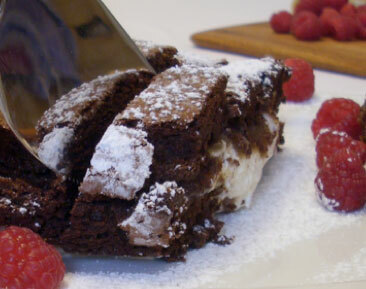 Spread the roulâde generously with crème de marron and then pile on the whipped cream. Using the paper to help you, and starting from the long edge, roll the roulâde up like a Swiss roll. 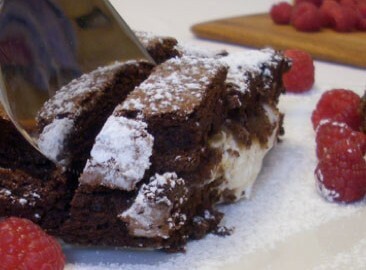 To serve straight away place on a serving plate and dust the roulâde with icing sugar. Alternatively, you can roll it up in the greaseproof paper followed by foil and keep it in the fridge overnight or store it in the freezer for longer. As a finishing touch, sprinkle raspberries around the roulâde when ready to serve. Enjoy the fruits (and chocolate) of your labours!